The weather played a role in keeping the attendance to just over 10,000 fans, about half of the Series average, and also as to who would pitch for Detroit that day. Manager Jennings went with his Midwestern-born George Mullin over his other pitching star, Wild Bill Donovan. Mullin had a reputation as a cold-weather pitcher, and had proved it in 1909 when he ran off 11 straight victories to begin the season. Demonstrating a workhorse mentality, Mullin had pitched a complete-game victory on Tuesday and tossed eight innings in the Series opening loss just six days earlier. Before the game, Jennings had asked Mullin if he was strong enough to go again. “The arm feels fine,” Mullin replied. “I think I can tie that Series up for you.”3 Pittsburgh started the considerably fresher veteran Vic Willis, a 23-game winner, who in this series had pitched only once in long relief in the Game Two loss to Detroit. Manager Jennings’ upbeat personality and his motto “Today is the day, boys,” had been a recurring theme throughout the 1909 season.4 It did look as though it would be Detroit’s day when Mullin fired a strike from his right arm with the game’s first pitch. But, quickly, Jennings’ words rang hollow. The partisan Detroit fans sat by nervously as the visitors racked up four straight hits to begin the game, including two that narrowly evaded Tigers fielders. When cleanup batter Wagner laced a two-run double, and Pittsburgh raced to a 3-0 lead, they appeared to be on their way to a World Series championship. According to one scribe, when the Tigers managed to score in the bottom of the first inning, “that one run changed the whole outlook.”5 Wahoo Sam Crawford drilled a double to center field that scored Donie Bush from second and cut the Pirates’ lead to two runs. Mullin settled down on the mound, holding Pittsburgh hitless and scoreless until the sixth inning. In the meantime, Detroit managed to tie the game with a pair of scores in the fourth and then took the lead with a run in the fifth inning. When Cobb managed a two-out double into the right-field corner in the sixth, fellow outfielder Davy Jones crossed home plate and the Tigers saw their margin grow to 5-3. The fact that Cobb was still playing in the World Series became a story in and of itself. Earlier that summer, while the team was in Cleveland for a series with the Naps, the short-tempered superstar had allegedly stabbed a hotel worker during an argument. Secret grand-jury testimony had been leaked and the plan was that when Cobb traveled with the Tigers through Cleveland to Pittsburgh, he would be arrested and charged with a felony. So, Detroit’s management put Cobb on a different train than the team, one that chugged through Canada to Buffalo and then south to Pittsburgh.The same tactic was employed for his return trip to Game Six in Detroit. While controversy surrounding Cobb was nothing new, he’d showed up considerably late for Game Five in Pittsburgh, leading to some anxious moments. A couple of head-turning defensive plays highlighted the game’s middle innings. 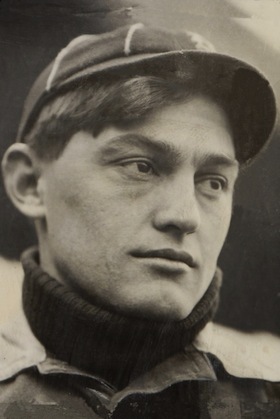 While Detroit managed to tally twice in the fourth inning, a rifle throw from Pirates right fielder Chief Wilson to Wagner covering third base cut down a Tiger and helped to limit the scoring damage. For Detroit, catcher Boss Schmidt, who had seen the Pirates run at will so far in the Series with 13 stolen bases, turned a neat double play in the Pittsburgh sixth. The Pirates had broken Mullin’s stranglehold with a one-out single by rookie Dots Miller. Then, Bill Abstein hit a towering foul ball behind home plate. Schmidt had a long run in foul territory and, with his back to the infield, corralled the pop up in front of the grandstand. Miller, sensing that the Tigers’ catcher had forgotten about him at first base, dashed for second. Schmidt wheeled and fired high to Bush covering second. Bush jumped and snared the errant throw and while coming down, dropped a tag on Miller, who was attempting to slide under the airborne shortstop. The next inning, after Pittsburgh had advanced a runner to second base with two outs, Bobby Byrne hit a line drive on the left side of the infield. The “screecher”was nearly past shortstop Bush, but he lunged and stabbed the ball out of the air, ending a Pittsburgh threat.6 These three plays had the Bennett Park crowd buzzing, but it was simply a hint of what was to come. Pittsburgh began the ninth with Miller singling to right, while Abstein followed with a base rap to center. On Wilson’s bunt, Schmidt scampered from behind the plate and chucked the ball errantly to first base. First baseman Tom Jones reached for the wild toss near the baseline, just as Wilson arrived at first. The collision jarred the ball loose, knocking Jones unconscious, and he dropped like he’d been “shot.”9 Some feared that Jones, having landed on his head, was killed on the play. As Tigers’ second baseman Jim Delahanty scrambled for the rolling ball, Miller scored and Abstein raced to third, while Wilson, remained at first base. Jones was so badly injured that a doctor dashed from the crowd to render aid, while the Tigers trainer sprinted from the dugout, and players from both sides surrounded the prone Jones. To add insult to injury, he was charged with an error on the play. He was carried off the field by his teammates, and manager Jennings had to replace the slick-fielding first baseman with outfielder Crawford. Jones’s right arm and experience were seen as strengths of the infield, far outstripping the skills of Crawford, a veteran of less than a season’s time at first base, over his lengthy career. As luck would have it, however, the next batter, Pittsburgh’s George Gibson, hit a Mullin curveball to the newly planted Crawford. In one elegant motion, the left-hander scooped the ball up and fired a strike to home. Catcher Schmidt dropped down on both knees to block the plate, as Abstein crashed into the burly Tiger. Despite inflicting a 6-inch gash with his spikes on Schmidt’s thigh, Abstein was out. With runners now on first and second, relief pitcher Deacon Phillippe was scheduled to bat, but Pittsburgh manager Fred Clarke sent Ed Abbaticchio to pinch hit. Fans back home crowded the streets in front of the Pittsburgh newspaper offices, following posted game updates, and yelled, “Get a hit, Abby!”10 Abbaticchio battled with Mullin and managed to reach a full count. On the payoff pitch, both baserunners were off with the delivery. Abbaticchio swung and missed for the second out and the inconsistent Schmidt was called on again to throw to a base. He fired to third baseman George Moriarty, who sprawled to catch the peg, block the bag, and attempt to tag Wilson. Both men dove for the base and crashed into each other. Out of a cloud of dust umpire Bill Klem waved his arms and signaled the game’s final out. Detroit had won 5-4 and lived to play a Game Seven. On Saturday, October 16, the Tigers lost Game Seven, 8-0, and the World Series title to Pittsburgh. Detroit hurler George Mullin made yet another appearance and pitched six innings of relief. Reichler, Joseph L., ed., Baseball Encyclopedia, 4th Ed, (New York:MacMillan Publishing Company, 1979). 1 R.W. Lardner, “Tigers 5-4 Victory Costs Three Men,”Chicago Daily Tribune, October 15, 1909, 8. 2 H.G. Salsinger, “Men of Jennings and Clarke Line-up in Sixth Battle,”Detroit News, October 14, 1909, 1. 3 FredLieb, The Detroit Tigers (Kent Ohio; Kent State University Press, 2008), 134. 4 H.G. Salsinger, “Today is the Day Boys, Slogan of H. Jennings that Landed Pennant, Detroit News, October 1, 1909, 22. 5 Lee Anderson, “Best Game Ever Played, Verdict of 10,535 Fans,”Detroit News, October 15, 1909, 21. 6 M.W. Bingay, “Just Gameness Won Yesterday’s Battle for Detroit Team,” Detroit News, October 15, 1909, 21. 10 “Gloom Pervades Pittsburg,” New York Times, October 15, 1909, 12; “Pittsburg Is a Sad City,” Detroit Free Press, October 15, 1909, 8.